What would happen if the Chicxulub asteroid never hit planet Earth? What if the very extinction of the dinosaurs never happened? Would humans exist, and if so, would they be different? The Dinotastic Adventure of Amelia Apeheart is a third person puzzle platformer straight out of your 90s nostalgia. You are Amelia Apeheart, a famous and daring explorer of the ape-society in the year 1937 A.S (Anno Simian). One day, her plane malfunctions and maroons her on a strange island, and she must explore her surroundings, befriend the natives, and with their help, solve environmental puzzles with the power of the elements in order to find a way off the island. For this project, I had the role of game designer, lead level designer, sound designer and composer. 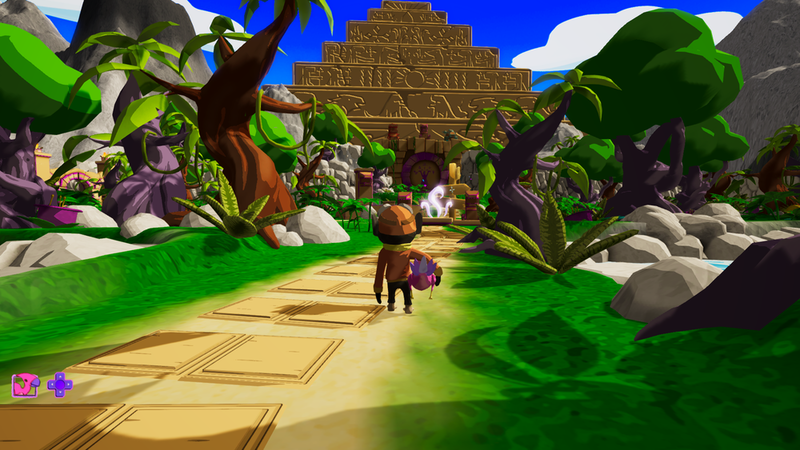 Working on the level design, I was in contact with the artists of our team frequently as well as I was spending a lot of time working with our game design lead & lead programmer to make sure that the level made sense artistically as well as it complimented and was adjusted based on the systems that were designed and later implemented. As level design lead, I was tasked with creating the biggest portion of our game's levels, which is the open-world-like hub + the more linear elemental areas, which I will be writing in detail about in just a moment. In addition to this, I also did additional scripting that weren't part of the core systems (moevement/effects state/menus etc. ), but rather puzzle elements and other interactive elements of the level itself, such as pressure plates, doors and traps. My role as sound designer and composer also had me work with DAWs (digital audio workstations) such as Audacity and Logic Pro X to create sound effects and soundscapes for our game, as well as writing and recording music to be used both in game and in the menus. Implementing the sounds was done with the help of our lead programmer as it involved implementing them into the scripts he had been working on, but I did create a similar system to the ambience engine I made for Night Terror's soundscape, which you can read more about here if you'd like. This page will mostly be covering my role as lead level designer, and we have a lot of ground to cover. The level starts out with the player being stranded on a beach with nowhere to go but forwards. Immediately, the player will learn how to control the character and get familiar with the physics mechanics without other interruptions. First the player needs to do a series of jumps; one short and one longer, to show that the game uses variable jump strengths depending on how long you hold the jump-button. The player is then introduced to seesaw’s a recurring platforming elements which responds to weight on either side of the middle axis, and suggests that physics will be play a part in the different platforming and puzzle elements to come, it also lets the player practice the jump distances a bit more, as it is fastest to do a short jump onto the seesaw, then a long jump off of it, immediately repeating the process. And if the player don’t get the jump right the first few times, there is nothing at stake, as this is a safe area that won’t kill the player because of one mistake. Now is the time to let the player get familiar with the other core mechanic of the game: the dinosaurs and their powers. The player now encounters a wind-dino, which is used to push and pull physics objects in the world. After picking up the dino, the player gets a prompt that teaches them how to use the UI to equip a dino to a d-pad-direction of their choice, and then they are confronted with their first real challenge. This challenge is to use the dinosaur to pull a platform out from the structure ahead so they can gross the first gap with a killplane. The stakes are raised a little bit now that the player possesses more power, but even if they fail, I have been generous with checkpoints, and our programmer made the respawn very fast, which together makes dying not as frustrating as it is in many platformers. The player’s next challenge comes after some descending platforms takes them closer to sea level, and they are not expected to pull multiple platforms and jump in between them and one static platform to get to the other side of the water, gradually increasing the difficulty in platforming and has the player look at the entire situation before jumping ahead. After this, the player arrives in the hub. The hub is a central point for our four areas; the introduction/wind area, the fire area, the ice area, and the final area combining the elements for the most complex puzzles. 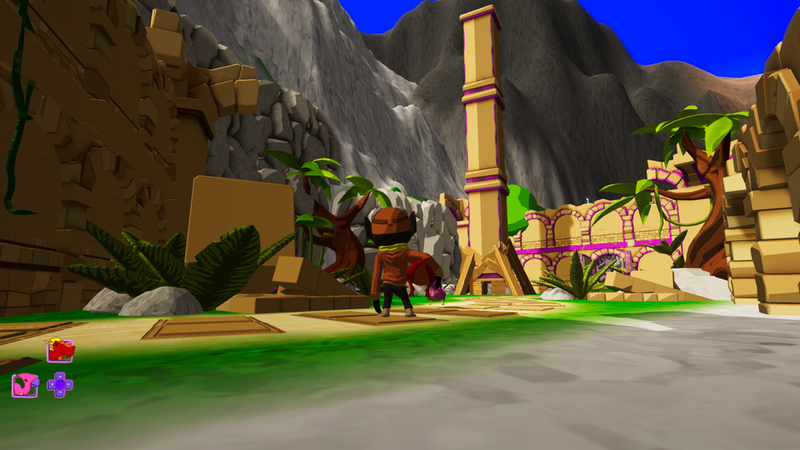 The player can tackle the fire or wind area in whatever order they’d like, but in order to get to the final area, they must have beaten all the previous areas and activated a shrine at some point in the areas. These shrines are impossible to miss, as they need to be activated within to progress even within the specific areas themselves. The fire area starts off with a simple puzzle where you’re introduced to the effects of the fire dino by burning down some trees blocking your way. 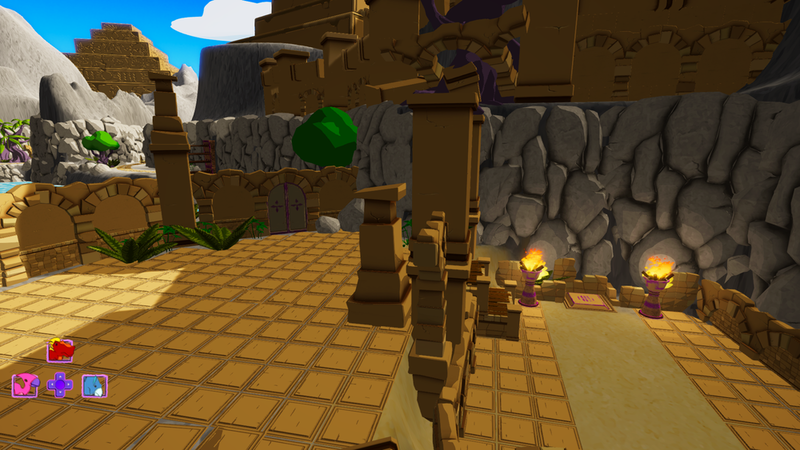 The player learns that trees and dry, wooden objects are burnable in our world, and gets to move on with some light platforming before encountering the next puzzle. This is another well-known mechanic in adventure games, which is to have the player light up nearby torches in order to open a door. The next puzzle also involves opening a door, but this time by pushing a pressure plate on the floor next to it, another commonly known mechanic, but still obviously presented by having the door be within an arm’s length of the plate. The player notes that the door opens, and perhaps tries to walk through, but when they leave the pressure plate, the door closes again. So they know that the plate needs to be pushed down for as long as they would need to go through. If they hadn’t already noticed, they certainly will now after looking around for a few seconds that there is a box up on a dried out, wooden platform right next to the door as well, and having recently used a fire dino, they should be able to piece together the pieces to burn the scaffolding to have the box drop, then push the box onto the pressure plate. The next part is just a room containing the shrine and a bunch of plant life, with a closed door at the end of it. This door is opened by activating the shrine that shows a symbol of fire, hinting that you should use your recently acquired fire power on the shrine to activate the shrine and move on. And even if this is too unclear, we put plants nearby the shrine so that player who just liked to burn things would still “accidentally” activate the shrine and be able to move on. Figure 5: A pillar with purple markings, indicating interactivity, stood upon wooden boxes, practically screaming "burn us". The last puzzle of the fire area has the player circumvent the closed door of the area almost entirely. By walking up ot the door, they can see that there is a pressure plate nearby, but it has been broken by a collapsed piece of architecture, and they need to look around for an alternative route. The moment they turn around, they see a big pillar that they may have missed when walking past it the first time because of the sight of the door, and the second glance reveals that it is patched up with dried up woodwork. 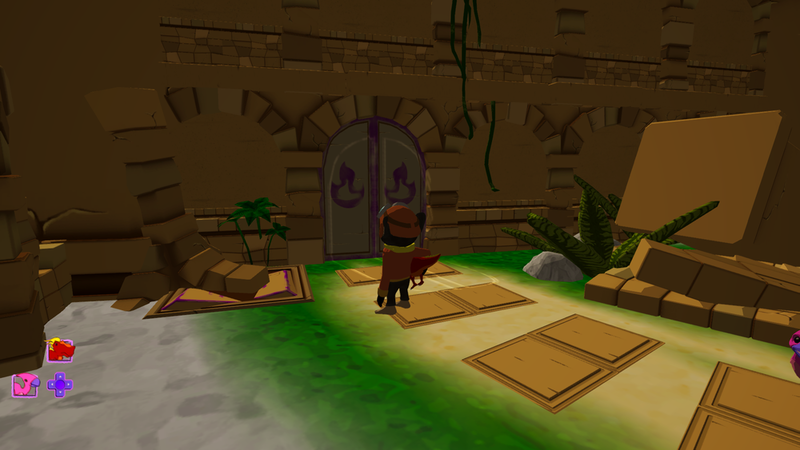 By burning this patchwork, the pillar falls over and collapses near the wall of the closed door, and the player can jump onto and walk across the pillar, and then jump over the wall and continue with their quest. The last part of this area involves some more platforming, as well as a few more wind-platforms used earlier to mix up the gameplay and have the player occasionally switch out dinosaurs. The player then re-enters the hub with a sight of the big gate as a reminder of their objective, and they are free to enter if they did the fire area last, or they can enter the ice area to finish up the level. Figure 1: The introduction to the ice dino, freeze the traps and you're free to go! The ice area plays a little bit more with the idea of implementing physics in the puzzles, as the ice state was created to add physics properties that made frozen objects slippery. It starts however with a concept that is more immediately recognizable: frozen things don’t move. The ice area contains death traps, spears that shoot out from walls and the floor, and the first thing the player needs to do is to freeze the tiles that the spears are coming out of while they are still retracted so that they can move over the floor tiles without getting poked. The spears will freeze in the position that they are frozen in, but if you time it badly, they have a thawing period of about 5 seconds before they go back to normal and you can try again. The next puzzle has the player push a box onto a pressure plate to open a door. The box gets spit out by a statue, but is set on fire by a torch next to the statue, and the box breaks moments after hitting the floor. The player now has a choice to either jump and freeze the box in mid-air to extinguish the flame and then push it onto the pressure plate, or to look for the platforms leading up to the statue and the torch to then extinguish the torch and have the box be spawned and not set on fire, and then push it onto the pressure plate after it has landed safely next to it. Now is the time when physics starts playing more of a role in the puzzles, and to introduce this, we have door that is opened by a pressure plate which keeps it open for a short amount of time (indicated by the hourglass symbol on the pressure plate), and has the player freeze the platforms that are placed in front of the door, which will give them a slippery property that propels the player forward with greater speed than their regular run speed. 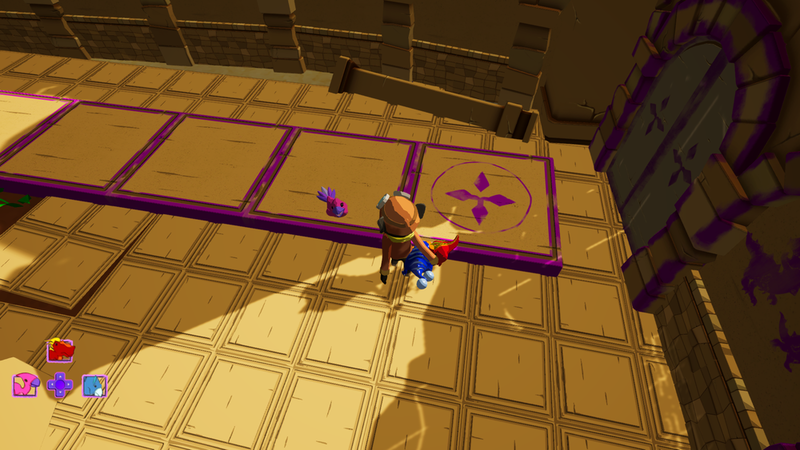 The platforms themselves are, like other interactive puzzle objects, highlighted in purple to show that this is an important part of the architecture, and you should pay closer attention to it and its relation to the surroundings. This is particularly important in this puzzle, as it is part of the floor of a similar color. The next room is a room similar to the fire area shrine room, and will also keep the player in that room until the shrine is activated by using the recently acquired dinosaur power on the shrine, this time symbolized with an ice crystal. The following part adds a bit of platforming where you get to use the wind dinosaur to pull out a platform and the ice dinosaur to freeze a death trap, now mixing the two in close succession to again have some variety in gameplay and make use of the wind power. Figure 8: A new take on the seesaw, this time it takes more than just a skillful jumper! The next-to last puzzle combines the previously seen seesaw and the recently used slippery physics, and the player needs to freeze the seesaw in a certain position to both stop it from shifting because of the weight of the player, and to give the player a boost in speed and therefore jump distance to clear a jump that would otherwise be just too long to clear with a regular jump. The final puzzle makes use of momentum and slippery properties again, but this time on a smaller object. The challenge is a familiar one: put a box on a pressure plate to open a door. But this time, the box is spawned on the opposite side of a pool of water, and it keeps tumbling into the water if the player isn’t able to push it across. This can be done one of two ways. The intended way is to have the player freeze the box in mid-air, so that it is frozen when it hits the floor, and therefore keeps sliding with the same velocity as it had in the air, clearing the gap and sliding neatly onto the pressure plate with its remaining speed without further help from the player, opening the door. The exact way that the box slides onto the pressure plate perfectly was designed to make the player feel extremely clever for figuring it out and for executing well on the timing. The other way is a little more clunky, but still a viable option for those who thinks of it. You can also add to the box’s momentum with the push power of the wind dinosaur to make it clear the gap. This is less reliable in terms of what trajectory the box might get after being affected by the player’s position while using the wind power, and so requires them to jump across and push the box onto the pressure plate themselves. The last part of the area is another platforming section where you have to use both the wind and ice powers to get across, making this a bit more difficult than the last by now having a seesaw above water with nothing to stop it from spinning other than the ice power. The area is closed out by some more platforming that ends with at a lookout point where the player can see down onto the hub, again seeing the final gate to remind them that this was their goal. And if this was the final area that they cleared, the gate is now open and they can finish the level. The mechanic of the elemental status effects was established quickly, and so we started with designing different types of puzzles based on this mechanic early in development. In the beginning, we were going to incorporate four element types; fire, wind, ice, electricity, into our puzzles, and so we tested a bunch of ideas involving all of these effects as well as how they could make for interesting puzzles individually. After some time, the electricity element was cut due to time constraints, as it was both one of the less immediately intuitive mechanics as well as one of the harder ones to implement. The first designs were all very simple drawings showing the concept of the puzzles. As you can see in the examples showing the fire puzzles (figure 2), we have puzzles in varying difficulty that is meant to teach the player about the fire-mechanic before it gets combined with any other element. 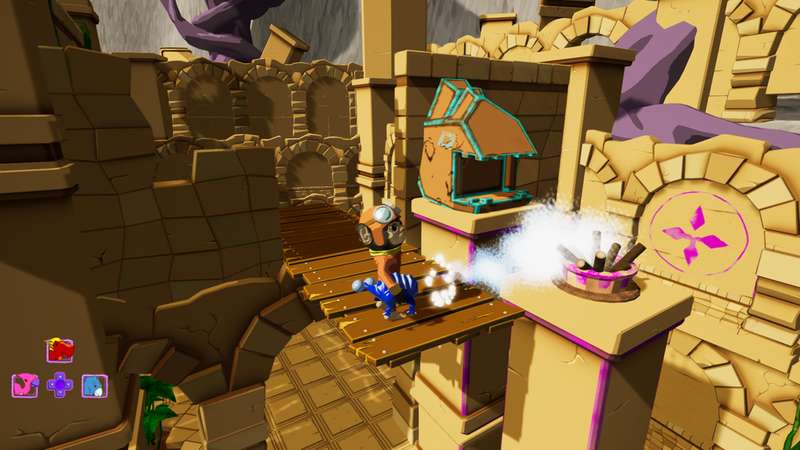 Starting off with lighting torches to opening a door (center), and then slowly working in physics elements like momentum, as the puzzle shown in the top left has the player roll a flaming ball down a ramp to hit a torch placed on a far-away pedestal. Then gravity we have examples involving gravity (top-right, bottom left) which has the player figure out how to get something out of reach or seemingly unhelpful into the situation where they serve a purpose with the help of gravity. The example in the top-right also utilizes the idea that is specific to the fire-mechanic, which is fire propagation, in which the player needs to set fire to one object just to have it spread to another object. Furthermore, there was an unused mechanic that served as a mutation of the regular lighting the torches puzzle, which was puzzles that had to be lit in a specific order, indicated by a sequence of knotted ropes hanging above the door. The placement of the knotted rope indicated when in the sequence the torch should be lit, and the number of knots on the rope indicated which of the torches should be lit. This was cut because we focused more the puzzles that actively used the elements in every step of the puzzle, as using the elemental dinosaurs proved to be the most fun part of the game. The images showing the first couple of puzzle ideas for the ice and wind elements (figure 2 and 3) follows the same principles, where some are simple ideas to get the player to understand the mechanic itself, then add other factors in like momentum, gravity, or mechanics specific to the element. Figure 5: The journey of the game's first moments, used as a baseline a level shown to stakeholders during our pre-production meetings. The level started out with a linear structure, as we showed in our first demo of the fire mechanic during our pre-production meeting, with the journey depicted here (figure 4) being representative of the rest of the game. This shows a moment-to-moment walkthrough of the game’s first minute or so. The journey had the player wake up stranded on a beach, with no other way forward than a road leading into the green, lush wilderness. 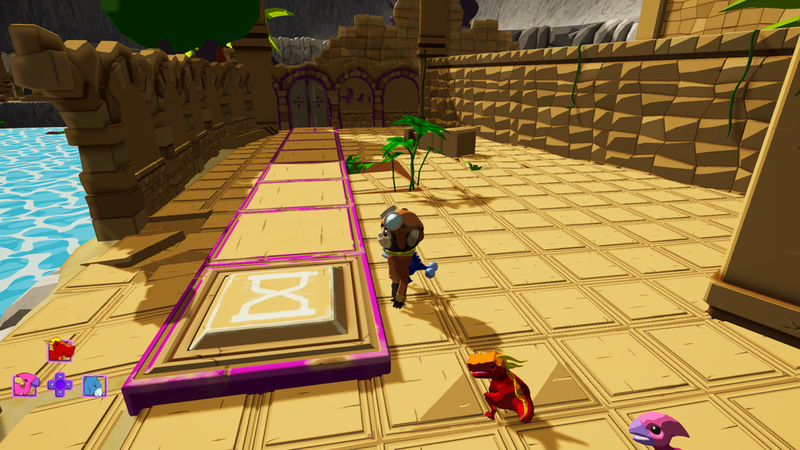 After some walking and perhaps a simple jump or two, the player would encounter the first dinosaur, and learn to use its fire-power freely on some nearby boxes while moving ahead in the level. Then the player would encounter a huge, dried out tree blocking their way, so that if they hadn’t already figured out that fire could destroy wooden objects, they would have to figure it out now in order to proceed. After this part, they would then enter an area that contained similar puzzles slowly increasing in difficulty, before encountering a new dino-power, and then the pattern would be repeated as well as new puzzles emerging that mixed the elements to create more complex challenges. Figure 6: The first version of our open world level with a central hub and distinct elemental areas. There were, however, people in the group who strongly wished for the game to have more of an open structure with a hub containing all the different areas containing the different dinosaur powers. They provided their arguments and I drew up a layout for the open-world version of the game (figure 6). This layout had the player start on the stranded beach as before, but not encounter a dinosaur until after they had entered one of the specific areas, and that the start area was to teach the players about the physics and platforming of the game. Then the player would go on a small quest within each specific area connected to the hub in order to gain elemental powers that would unlock the final gate leading into the combo puzzle area, and eventually to the end of our vertical slice. The group quickly took a liking to the idea, and I thought it would be a great challenge for our last project as a class. One thing I was very adamant about when it came to creating the hub, was that every time you re-entered the hub, you should have a direct view of the gate leading into the area, constantly reminding yourself of the objective.